Termax is keen to be involved at an early stage of development – with modern technology, creativity, and profound craftsmanship, we have a goal-orientated mindset from idea over feasibility analysis and planning to series production. With our directly integrated CAD-system, we ensure transfer of vital data from development to design and further on to series production, maintenance and spare parts. Ahead of any design and manufacturing, we naturally evaluate the feasibility. Termax manufactures complex dies for stamping, deep drawing, and transfer processes. Toolmaking, and especially the design of tools, is the key to reliable and efficient manufacturing of precision parts. The tool is the vital link between innovation and efficiency. In this early stage of a product, and thanks to intelligent design solutions, we bring our customers ideas to life. The integrated transfer of CAD data ensures an efficient and precise toolmaking. Passionate employees and professional conditions equipment at a high technological level ensure that we can meet the requirements of our demanding international customer base. 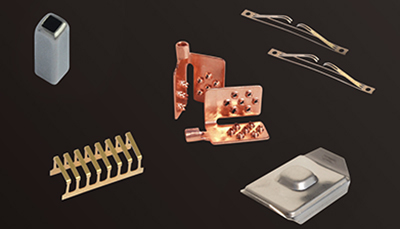 Termax is a specialized subcontractor within stamping – we manufacture fine precision parts from hand-sized components down to the tiniest components ranging from punched, bended, and cold formed components to deep drawn articles as well as connectors and springs. The range of machinery ensures that we have up to 100 tons at our disposal. The customized articles are finished in all types of steel, stainless steel as well as special materials such as titanium and nickel alloys for shielding and precious metals. The high level of reliability in the stamping production is based on the excellent work in the tool making. Assembly. Depending on the art and extent, we offer manual or automated assembly services. Test equipment and control setup will be tailor-made on an individual basis. Individual packing will be performed upon request. The surface is often the crowning achievement of product. The bar for the requirements of functional and visual properties are is high. The individual requests are plentiful and varied, including galvanic treatment, color, function, and decoration. In cooperation with professional partners , we are able to deliver the right surfaces. In-house, we supply cleaning, deburring and polishing of stainless surfaces. Quality and efficiency demand thoroughness. The result is efficient production methods and wisely chosen technology. Thanks to our creativity and flexibility, we can conveniently and favorably prepare tests and prototypes as well as minor series with a precision which ensures functionality. Complementary specialists and techniques are pulled in to ensure optimal bridging between the product idea and the following series production. Special equipment – quality, efficiency, and feasibility can require special customized equipment. With decades of experience within production, control technique, and pneumatics, Termax is able to support and develop a setup supporting the competitiveness of our customers – which is the decisive factor for long-term partnerships. The result and the added value that we create for our customers is undoubtedly our top priority.